Julius Conus (Juli Eduardowitsch Conyus or Konius) was a French violinist and composer born on February 1, 1869 (Brahms was 36 years old.) He was actually born in Moscow since his family had migrated to Russia in the early 1800s. Today, he is remembered for his violin concerto in e minor, although he wrote other music, though not much. 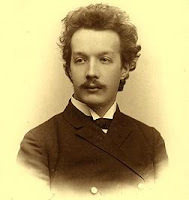 He studied violin with Jean (Jan) Hrimaly (a Czech violinist) at the Moscow Conservatory and received the gold medal in 1888. At the same time, he studied composition with Tchaikovsky. Afterward, he studied in Paris (with Joseph Lambert Massart) and played in the opera orchestra and in Edouard Colonne's Orchestra as well. He was concertmaster of the New York Philharmonic from 1891 until 1893. He returned to Moscow in 1893 to teach at the Conservatory, concertize as a soloist, and play in chamber music ensembles. One of his students was Ivan Galamian. He premiered his popular violin concerto in 1898. He had been working on it since 1896 and he dedicated it to his teacher, Jean Hrimaly. Fritz Kreisler and Jascha Heifetz both championed the concerto, though critics never liked it. Conus moved out of Russia again in 1919, establishing himself in Paris and teaching at the Russian Conservatory there until 1939. In that year, Conus returned to Moscow where he lived out the rest of his life. He was 70 years old. It has been said that the Russian government refused him an exit visa and starved him to death because he refused to join the Communist Party, putting out a decree that anyone helping him by offering him food or shelter would be imprisoned. He supposedly died on the streets of Moscow on January 3, 1942, at age 73. Nobody intervened to save him - however, all of this is hard to believe because he was still a French citizen when he died.